With body camera footage becoming more and more important to cases drawing widespread national attention, police departments in California are proactively drafting policies to prepare for what they feel is an inevitable mandate – that all officers use and wear the body cameras. Most civilian and police groups agree the devices build transparency and answer the community concerns—but there are still hurdles to adopting the technology. In Southern California, Los Angeles and Burbank police departments have begun talks with civilian oversight organizations to ensure officers use body cameras with the best possible practices. “Our goal is to draft a policy that will be the industry standard for other organizations to come to us to have that best policy,” said Deputy Chief Mike Albanese from the Burbank Police Commission. Though the time frame for when officers will actually begin wearing the cameras is unknown, the public assumption is that it is will happen soon. The biggest obstacle to the body cameras being implemented is the cost involved and the reliability of the storage technology. Burbank looked at buying cameras in 2015 and found the price tag–$570,000—was a bit steep for council members to approve. While the cost is an issue that police departments and city councils across the nation will have to contend with, we here at DIGISTOR know that data reliability will not be an issue so long as our practices and technologies are employed. DIGISTOR offers a portfolio of solutions for reliable law enforcement data storage, including Flash-based storage for body cameras and in-car video devices. For more information about our suite of police storage devices, visit our product page now, or reach out to a DIGISTOR representative today. DIGISTOR was approached by a large, successful manufacturer of body worn camera equipment in 2013 concerning the launch of a new camera targeting the law enforcement community. The camera had a beautiful industrial design, and was loaded with several new features including very high resolution video. The software developed integrated seamlessly with a full chain of custody solution, ensuring that the digital evidence would be admissible in a court of law. But, there was one problem. The microSD card originally selected for the camera continually became corrupted, thus losing valuable evidence and making this new body camera all but useless. Although hundreds of thousands of dollars had been invested in the camera’s hardware and software development, very little investigation was done into the data storage solution the video would ultimately be written too. The manufacturer turned to DIGISTOR for help. Speed. The customer had a critical high speed write requirement that the SD card had to achieve under all circumstances. Reliability. It was crucial that not only the video was protected from corruption, but that the manufacturer’s customers could have a firm understanding of the life expectancy of each card. Early on in the design process, the manufacturer focused heavily on speed as the number one requirement. Working closely with the DIGISTOR firmware engineers, the manufacturer was able to achieve the performance needed for video capture of high resolution video. Moving on to the reliability requirements, the engineers quickly realized the two bigger issues were the lack of consistency on longevity of the microSD cards, and an unacceptable failure rate. DIGISTOR provided an application analysis card which the manufacturer ran in a real life application scenario for a 2-week period. DIGISTOR analyzed the data captured to determine how the application was accessing the SD cards, which also showed the write/erase counts. The data analysis also showed incompatible access patterns within the customer software which could be altered to help overall reliability. DIGISTOR was able to perform a Failure Analysis (FA) on the failing cards that showed how the manufacturer’s application was writing to the SD card and where the issues were occurring. By having a full understanding of how the video application accessed the SD card and also how the software was over-stressing memory cells due to unevenness of the write/erase cycles caused by incompatible access patterns in the application itself, the DIGISTOR engineering team found that the standard wear-leveling algorithm was not activating properly and causing corruption within the SD card. 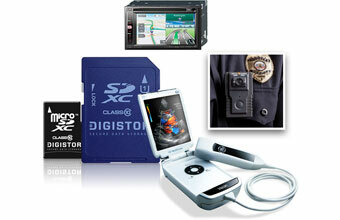 DIGISTOR was able to modify standard firmware to meet the requirement of the video application. DIGISTOR recommended the manufacturer make changes to the software, which improved the overall performance of the SD card and BWC application.The manufacturer was able to achieve both the performance and reliability needed for a successful new camera launch. Today, the manufacturer continues to grow share in the body worn camera market and achieve a solid ROI on their secure data platform. Police agencies around the country are ramping up their Body Worn Camera (BWC) policies and procedures. High profile police assault videos have continued to surface on the internet creating a public outcry for reform, training, and accountability. Federal grants to help fund policing services need for BWC deployments are rapidly expanding. These subsidies have created a whirlwind of new manufacturers into the BWC business looking to take advantage of federal grants and a growing market. BWC cameras have a variety of features including high definition video capture, night vision, and ruggedized housing. BWC cameras record video evidence on an SD card similar to what you would use in a standard camera. That is part of the issue, most agencies and BWC manufacturers use off the shelf consumer SD cards to acquire and store video evidence without even realizing it. These types of SD cards are at very high risk of corruption. Consumer cards do not offer extended temperature support and are at risk of failure in both hot and cold climates. Standard SD cards will fail in several instances including being left behind in a hot car for just a short period. Most standard SD cards do not offer a Power-Fail feature or robust video acquisition firmware to keep from having corruption or overwrite issues. The testing and components used by consumer card manufacturers are not to the standard needed to provide a secure and robust BWC video storage solution. The real question is how to protect crucial video evidence best on Body-Worn Cameras and ensure the proper video evidence gets from the camera to the courtroom? Agencies, BWC manufacturers, and surveillance companies can solve a lot of support and security issues by asking their current BWC supplier specific questions about the storage onboard their BWC camera. The first step is not to be so caught up on speed; these cards are all very fast. That said all SD Cards are not all equal, so it is important to design a card for your particular application. A few important questions to ask your BWC provider and ensure you have the best possible secure storage for your BWC application. What operating/storage temp is your card supported, both heat/cold? Does your SD card have a locked Bill of Materials (BOM)? Does your SD card use TLC, MLC, or SLC flash? Can you lock your SD card to one specific camera for security purposes? Can your SD card protect against accidental deletions? Do you have a power-fail feature? Again be sure to look deeper than basic specifications such as read/write speeds, sometimes the fastest card may not be the best card for your application. Understanding your overall application and how it accesses the flash within the SD card itself is much more important. Understanding your overall BWC application demands and lifetime expectancy of your BWC camera is crucial to both protecting key video evidence as well protecting the agencies investment. Securing the video until transferred to a more secure and permanent location is the biggest question facing the BWC community, and they don’t even know it yet.